Finding peace with God is not complicated, although it may be very challenging. Please read the following four facts and see if you’re up to the challenge! God loves you and wants to be your Heavenly Father. People are sinful and separated from God. Humans were created to have fellowship with God; but, because of our own stubborn self-will, we chose to go our own independent way and fellowship with God was broken. This self-will, characterized by an attitude of active rebellion or passive indifference, is an evidence of what is called sin. 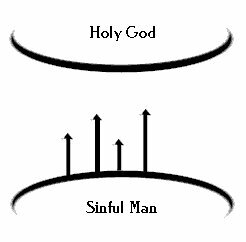 This diagram illustrates that God is holy and man is sin­ful. A great gulf separates the two. The arrows illus­trate that man is continually trying to reach God and the abundant life through his own efforts, such as a good life, philosophy, or religion—but he inevitably fails. Jesus Christ is God’s only provision for man’s sin. Because of him, you will know and experience God’s love and enjoy the benefits of being his child. 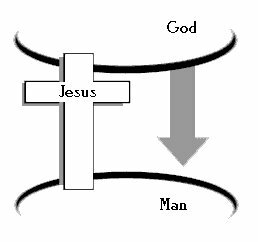 This diagram illustrates that God has bridged the gulf that separates us from him by sending his Son, Jesus Christ, to die on the cross in our place to pay the penalty for our sins. When you repent of your sins, God is able and willing to forgive you, because Jesus Christ’s death on the cross paid the penalty for your sin. To repent means you agree that you have sinned against God, are sorry for your sins, and wish to avoid sinning in the future. As you see, it is much more than merely being sorry. When you repent of your sins, God will forgive you because Jesus Christ’s death on the cross paid the penalty for your sins: past, present, and future. Heavenly Father, I have sinned against you. I am sorry for my sins, and I want your forgiveness. Thank you for sending your Son Jesus to die on the cross for my sins. Thank you for forgiving my sins and giving me a new life as your child. Take control of my life, and make me the kind of person you want me to be. If you sincerely told God the above prayer, it’s time to start growing as God’s child and enjoying being in God’s family! Ask God to lead you to a group of Christians with whom you can learn more about God and the Christian life. This may be a traditional church, a home Bible study group, or something else.